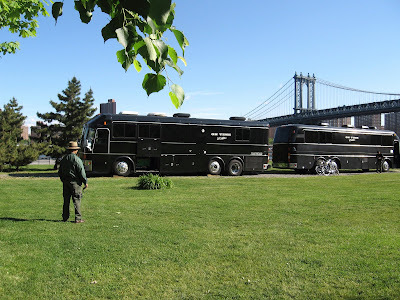 Why Do They Get to Park Trailers On the Grass in Brooklyn Bridge Park? The Park Ranger seems as bemused as everybody else as a film crew parked their big fat trailers on the grass. Admittedly the grass is worn out where they parked. Could this be why? The friggin' road (New Dock Street) is only 20 feet away! Can't walk that far? 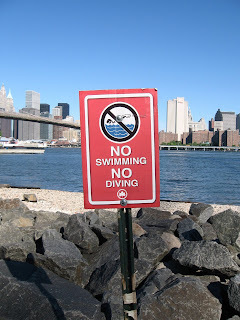 Is Brooklyn Bridge Park for Wimps? 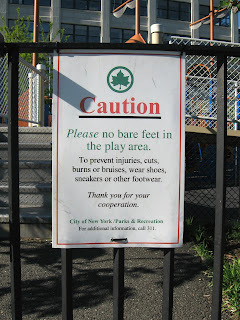 Is Brooklyn Bridge Park for wimps? Seems like everything is prohibited nowadays. 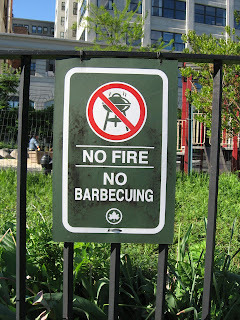 We used to barbecue under the Brooklyn Bridge but now it's fenced off. National security. 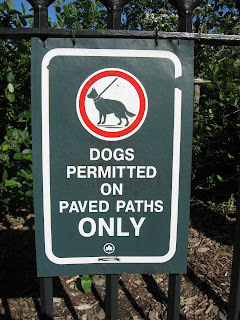 Right, just don't run on the grass, Fido. Don't. Sit. On. The. Rocks. Okay, we can buy this. This Saturday, May 31st, at 9:00 p.m., Brooklyn-based Rooftop Films will be holding a free screening of "At the Death House Door" in Fort Greene Park, Brooklyn. You may have read about this film the other day in the NY Times: Pastor Carroll Pickett oversaw 95 executions at a Texas prison, and the experience haunts him. He believes that some of the men he helped lead to death were innocent. The makers of "Hoop Dreams" examine this issue through the story of this unique anti-death penalty activist. The filmmakers (Steve James & Peter Gilbert) will also be in attendance for a Q&A after the screening. This is the "Rooftop Films 2008 Summer Series" warm-up show. Directions and program notes here. Rooftop Films screens every weekend, June & July all over the city. 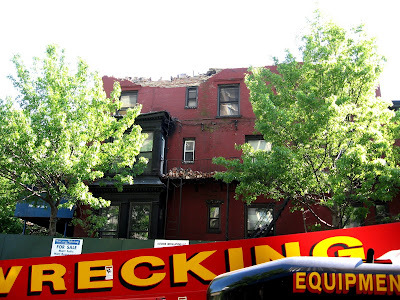 According to the Brooklyn Eagle, the top-to-bottom demolition of 100 Clark Street in Brooklyn Heights has come to an abrupt halt after the owner, Penson Corp., went to court to force the city to stop the wrecking ball. The Eagle got word that the City had decided to tear the whole building down -- then the work was halted. Only half of the "derelict" mansion in Brooklyn Heights remains, with apartments open to the elements, as the case now waits for a legal decision. The word on the street is that Penson Corp. is putting up the three now-homeless tenants in one of its other buildings. The landmarked but long-neglected 1852 building was found by inspectors to be so shamefully unsafe that the building was evacuated and a wrecking crew was sent in early Sunday. 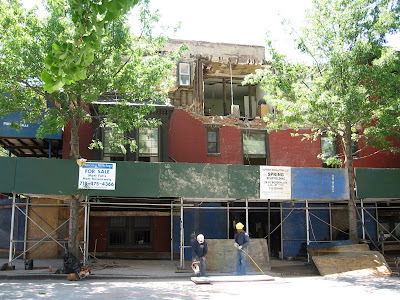 - 100 Clark Street Demolition Update -- How Far Will the Heights Let This Go? 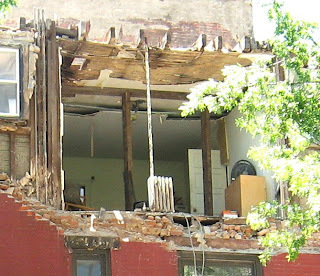 Demolition workers told McBrooklyn Wednesday that the "derelict" 100 Clark Street in Brooklyn Heights is coming all the way down. While not yet officially confirmed, this photo, taken around noon Wednesday, shows the building down to two-and-a-half floors. It started out as a five-story mansion on the corner of Clark Street and Monroe Place. 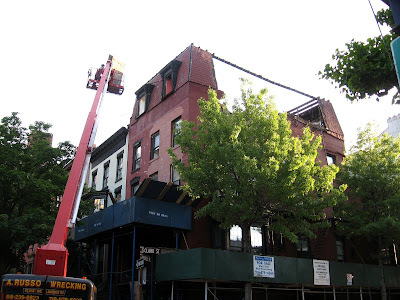 As reported here earlier, the landmarked 1852 building was found by inspectors to be so unsafe that the building was evacuated and a wrecking crew was sent in early Sunday to demolish "the top two floors." 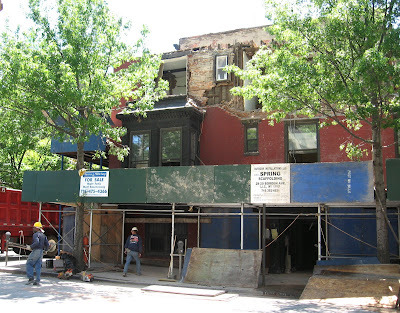 Judy Stanton of the Brooklyn Heights Association told the Brooklyn Eagle that the whole affair was a shame: "Landmarks could have worked collaboratively with the city to bring ‘demolition by neglect’ charges to force the owner’s hand to undertake restoration," she said. No word on what has happened to the three tenants -- though some of their possessions could be seen through busted down walls Tuesday and Wednesday. If the workers are correct, it appears that there will soon be a new vacant corner lot -- 1,950 square feet -- in Brooklyn Heights. UPDATE: Owners go to court to halt demo. Story here. - Brooklyn birds are up jabbering all night, "out on the prowl like sluts." Brooklynian via Gowanus Lounge. Marco Polo Ristorante, at 345 Court Street in Carroll Gardens, will be celebrating its 25th anniversary in June by offering special prix fixe anniversary menus, according to the Brooklyn Eagle. This is one of those places where we've wanted to go forever, but somehow never got around to it. My mailman, who should know, recommends it highly. "My father is an old skool Italian dude (think love child of Tony Soprano and Paul Sorvino). I took him to Marco Polo last time he came to visit me and he seriously hasn't stopped talking about it since. It's like all of a sudden he gets a Brooklyn accent and talks about this place like his mom and pop own it. I let this silliness slide because it's really THAT good ..."
In February owner Joseph Chirico was caught up in a Gambino crime-family racketeering case. His attorney said Chirico simply did a favor for someone that he shouldn’t have, and joked about how Marco Polo Ristorante "just can’t serve the Godfather Special anymore," according to the Eagle. Three-courses at lunch for $19.83 (get it? 1983?) and $25.00 at dinner (open 25 years). Take a look at the regular menu, and you'll see it's a steal. The special offer runs June 4-30. Ever think the comments are better than the post? Now New York Magazine dissects a Brownstoner commenter who calls him/herself "The What." No one knows who The What is -- or even if The What is one person or many, since anybody can call themselves anything they want. Adam Sternbergh in "The What You Are Afraid Of" writes "His posting style is so schizophrenic that one might suspect he is either (a) several very different people posting under the same name or (b) schizophrenic." "He calls it the Mutant Real Estate Bubble. From the beginning, he has contended vehemently, and repetitiously, and often profanely, that there’s a massive correction coming to the real-estate market that will swallow the borough’s fresh-faced transplants and their artfully renovated brownstones as surely as if a chasm had opened up in the earth." Though many readers hate The What -- and some have asked Brownstoner to ban him -- lately, Sternbergh says, economic events have "somewhat inconveniently, lent at least a little credence to The What’s erratic raving." Photo by Aymlis, Creative Commons license. We stumbled upon the Eighth International Toy Theater Festival at Saint Ann's Warehouse in Dumbo the other day. 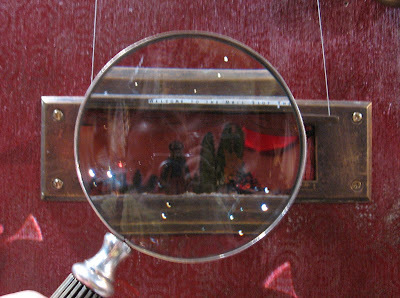 Besides one of the weirdest little exhibits (and it is little; everything is in miniature) we've seen in quite some time, there are a variety of programs of a cosmic, puppet, poetic or cabaret-type nature -- such as "Duncan Partone -- or -- The Boy with a Bird in His Heart;" or "The Matchbox Shows," which are teeny, tiny puppet shows performed inside matchboxes. "Turandot," by Jane Freeman. Click on photo to blow it up. Notice all those little bloody heads on sticks? "Main Slot Theater," by Serra Hirsch. It's actually in a mail slot. Looking glass provided. There are programs for adults and one for families, workshops and cabarets. These cost money, but the exhibit is free. The event runs till May 31. How Londoners appear to us here in Brooklyn through the Telectroscope installed at Fulton Ferry Landing. The actual image you see will be sharper (reflection problems when taking a photo) but this gives the general idea. Haven't seen the amazing Telectroscope? The lines are shorter now that the work week has started. See the links below for more. - Amazing Telectroscope Connects Brooklyn to London! 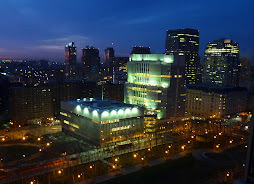 100 Clark Street Demolition Update -- How Far Will the Heights Let This Go? 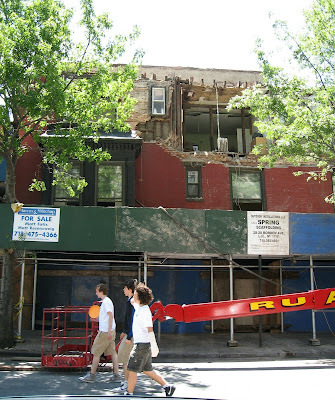 As reported yesterday, the "derelict" 100 Clark Street, in Brooklyn Heights, was found by inspectors to be so unsafe that the building was evacuated and a wrecking crew was sent in early Sunday to demolish the top two floors. A Buildings Department complaint states: "CALLER, DOOR OF THE RIGHT SIDE IS BOWING OUT THE SAME PROBIS ON THE 3RD FL & THE ROOF." The above photo was taken Monday afternoon. (You can see the original building contours in photos taken Sunday, here.) Crews continued to dismantle the building into the night Monday. Now neighbors are wondering just how far this will go. The building is landmarked -- it doesn't take a stretch to imagine that pretty soon cries of protest will be heard. The building has been up for sale by the Penson Company, which bought it two years ago. A friend gave us some strawberry plants last spring. 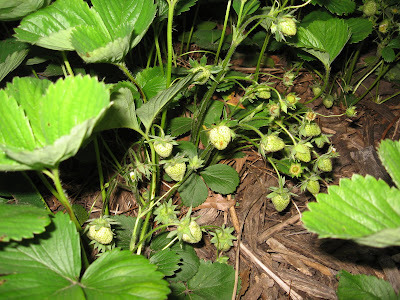 We planted the berries on our little deck and they spread like crazy. Look at all those green berries! Can't wait till they ripen. 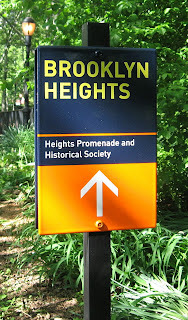 The Brooklyn Heights Association had warned that this kind of thing might happen and yesterday it did. Inspectors found 100 Clark Street -- long the scourge of the North Heights -- to be so unsafe that the top two floors had to go. Yesterday Clark Street was blocked off and a wrecking crew started knocking down the buldging top floors. 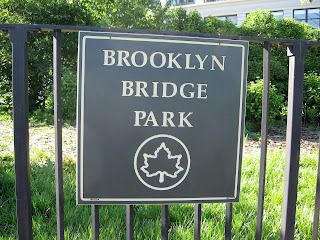 According to a poster on the Brooklyn Heights Blog, the three residents of the building were told they had to relocate. 100 Clark Street is one of three buildings that the Brooklyn Heights Association cited for "Dereliction of Duty" in the Spring Newsletter (Brownstoner has more details on this). 100 Clark has a loooong history of literally falling apart. 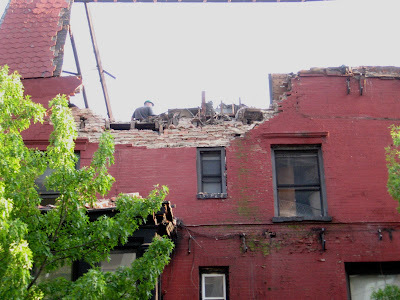 The Brooklyn Eagle has reported on neighbors dodging flying bricks as the building "buldged" and cracked; and the building being put up for sale as part of a portfolio of properties. What's next for this pile of untended bricks? Nice day for a bike ride, huh? A little R & R in the shade at Walt Whitman Park. 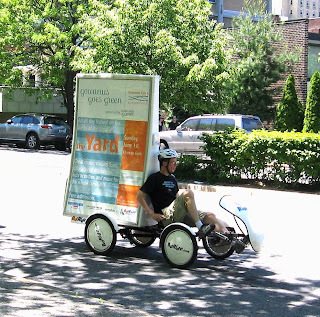 - Get Ready for the (2007) Tour de Brooklyn! 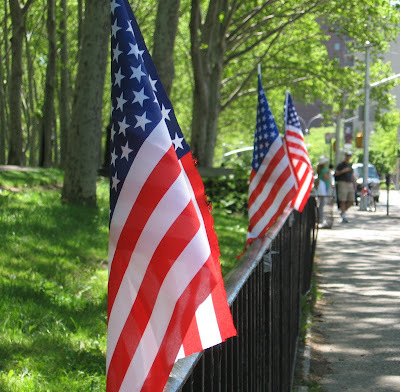 Someone taped six small flags onto the iron fence around Cadman Plaza Park. 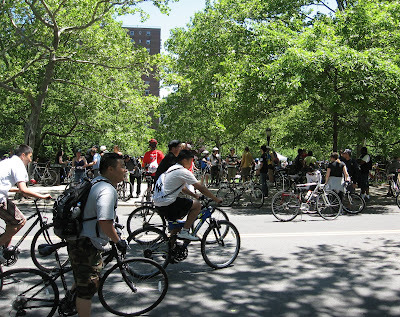 Tour de Brooklyn: For the fourth year in a row, 2,000 bicyclists will ride all around Brooklyn in this leisurely 18-mile bike tour. Participate or just cheer from the sidelines. 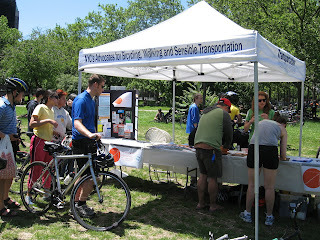 For advance registration, go to tourdebrooklyn.org. Family friendly. Free. Brooklyn Bridge Walking Tours: At 11am, Ron Schweiger, the official historian for Brooklyn, will give a tour of the Brooklyn Bridge (meet at the Manhattan-side arch of Brooklyn Bridge). At 1pm and 4pm, Dave Fieder—aka “Dave the Bridge Man”—will also give tours of the landmark (meet at Brooklyn side of the Brooklyn Bridge). Call 718-802-3846 for more information. Free. 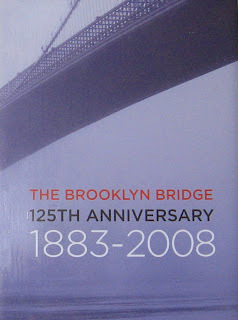 Lecture Series: In honor of the Bridge’s 125th birthday, the Brooklyn Historical Society will host of weekend of lectures and readings at their headquarters (128 Pierrepont Street at Clinton Street, Brooklyn, 718-222-4111) each hour from 1–3pm. Additional lectures will be held at Surrogate's Court (31 Chambers Street, Room 209, Manhattan) from 1–4pm. Seating is limited at all readings. The Amazing Telectroscope: Don't miss it! The Telectroscope is operating till June 15. Fulton ferry Landing. 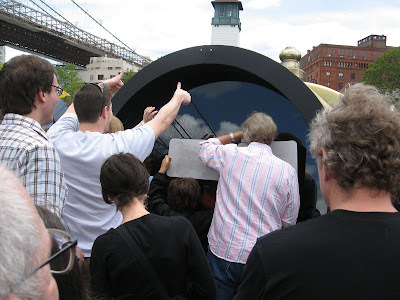 Below is a video of people interacting with the amazing Telectroscope, at Brooklyn's Fulton Ferry Landing. This engineering marvel allows people to "see right through the Earth" from London to New York and vice versa. Brooklynites and Londoners have been waving, gesturing and writing messages to each other since the Telectroscope was installed early Friday. One man wrote his cell phone number on the white board, and someone from the other side chatted as they gazed at each other. People are arranging to meet their brothers and sisters, girlfriends and boyfriends. The lack of sound is forcing people to be creative, and this adds to the enjoyment. Paul St. George is the creator of this scientific wonder. Tucker Reed, Executive Director of the Dumbo Business Improvement District, is off to Iraq. Here's a nice WCBS2 video send off. Lecture Series: In honor of the Bridge’s 125th birthday, the Brooklyn Historical Society will host of weekend of lectures and readings at their headquarters (128 Pierrepont Street at Clinton Street, Brooklyn, 718-222-4111) each hour from 1–4pm. Additional lectures will be held at Surrogates Court (31 Chambers Street, Room 209, Manhattan) from 1–3pm. Seating is limited at all readings. For a complete schedule, visit the Official Guide to the Brooklyn Bridge 125th Birthday Celebration. Free. 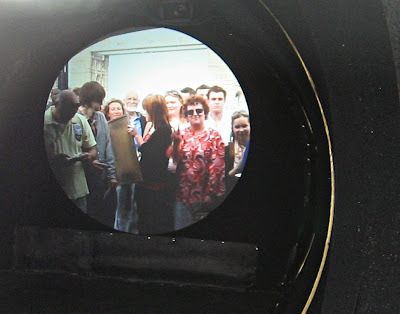 The Amazing Telectroscope: If you missed it yesterday, not to worry. The Telectroscope is operating till June 15. Fulton ferry Landing. 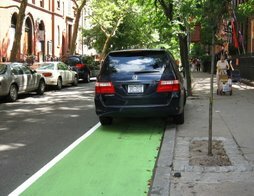 The whole weekend's schedule can be found at nycvisit.com. 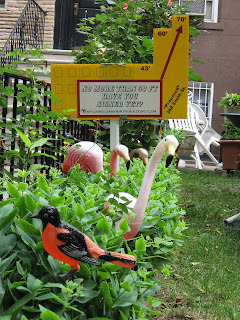 CORD sends us news Friday afternoon that the Borough President has approved the Carroll Gardens Zoning Text Amendment. 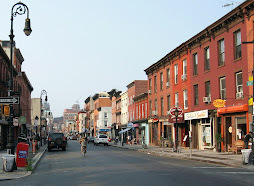 The amendment would correct the "unintended consequence of the application of the wide street definition" to the narrow residential streets of Carroll Gardens. These streets are presently misclassified as wide because they have large front yards, pretty unusual in this city. Builders can generally build taller buildings on wide streets -- and builders have been lining up to do so. The text amendment would limit the size of new buildings (and enlargements) to more closely match the area's prevailing character. 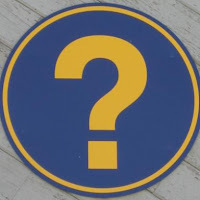 The next step is the City Planning Commission meeting on Wednesday, June 4th at 10 a.m., at 22 Reade Street, and then the City Council. It was a glorious fireworks and light display last night, a great start to the Brooklyn Bridge's 125 birthday celebration. Here are a few shots of the action. We've been awed by the amazing Telectroscope and bedazzled by the fireworks over the Brooklyn Bridge -- anything else going on? Brooklyn Bridge Film Series: Pack a picnic dinner and enjoy the sunset at the foot of the Brooklyn Bridge as DJs spin tunes. Stick around for an open-air showing of Walt Disney Pictures’ Enchanted (2007; rated PG), a modern-day fairy tale set in Manhattan. 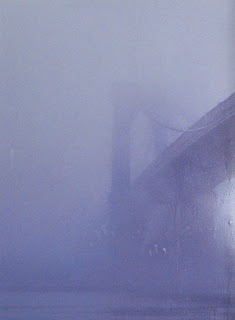 It will be preceded by two short historic films—Panorama from the Tower of the Brooklyn Bridge (1903) and Manhatta (1921). Music begins at 6pm; film starts at 8:30pm. This event is free—along with the popcorn. Empire-Fulton Ferry State Park, Dumbo. Brooklyn Bridge Information Tents: The American Society of Civil Engineers and the Roebling Chapter of the Society for Industrial Archeology will offer guided tours of the Bridge through Sunday, 10am–5pm. Free, on the Brooklyn Bridge. 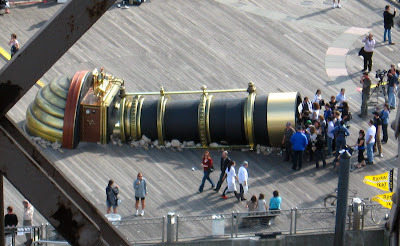 Amazing Telectroscope Connects Brooklyn to London! 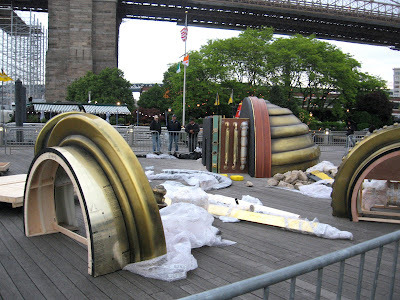 The amazing Telectroscope is up and working at Fulton Ferry Landing! Yesterday the secret tunnel between London and Brooklyn was completed. This morning the extraordinary optical Telectroscope was installed at both ends -- and for the first time ever, people saw right through the Earth from London to New York and vice versa. Brooklyn and London viewers happily communicated by waving, gesturing and writing messages on white boards (provided by the artist/inventor Paul St. George). The Telectroscope will remain installed through June 15, and participation is free. 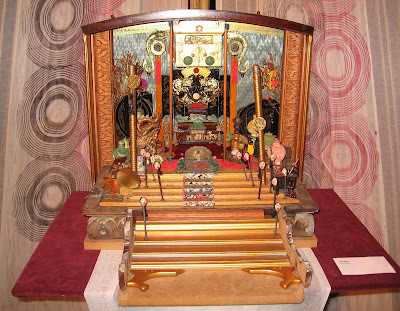 UPDATE: Tom Wright, blogging from England, is covering the other end of the Telectroscope! UPDATE 2: See the video here! 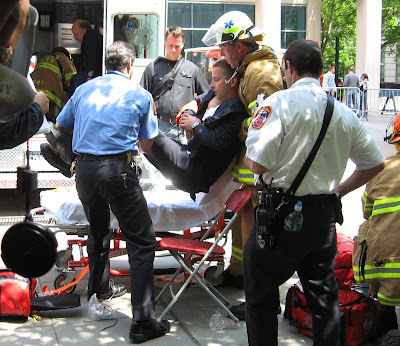 So the EMTs were called in to MetroTech in Downtown Brooklyn because a guy hurt his foot. No problemo, right? Wrong. He hurt his foot running away from a bad guy, and as the EMTs were fixing the foot, the bad guy comes running up and sticks a knife in his chest. A big fight erupts and BAM! -- the cops shoot the bad guy. Now the EMTs have two problems. As they try to deal with this, one of the rescuers becomes a little short of breath. Then a lot short of breath. Now the EMTs have three problems -- and very little time to solve them. 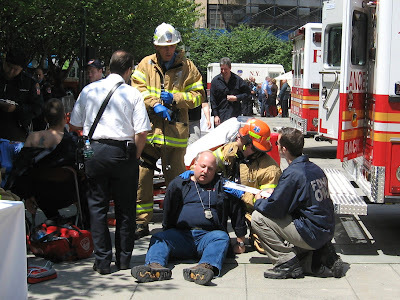 This was the scenario that happened 13 times Wednesday at the eighth annual EMT/Paramedic Competition/Exhibition in MetroTech Commons. The EMTs were competing against each other for recognition, prizes and pride. Things like this actually happen to EMTs and paramedics. They never know what they're going to run into when they work to save our lives. 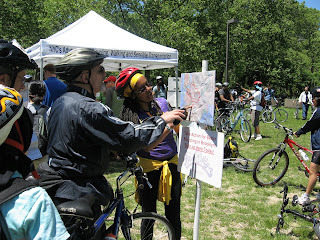 See story in the Brooklyn Eagle. A geographer for the City Planning Department has calculated that the city is smaller than originally thought, the New York Times reported -- and Brooklyn has taken the biggest hit. The city is about 17 square miles smaller than originally thought, and Brooklyn lost more than any other borough: about 10 square miles, going from 82 to 72 square miles. This double poster celebrating the 125th Anniversary of the Brooklyn Bridge has been added to the new signage recently installed under the bridge by the DumboBID. The party starts today -- expect big crowds in Brooklyn Heights/Dumbo/Fulton Ferry as the celebration kicks off. 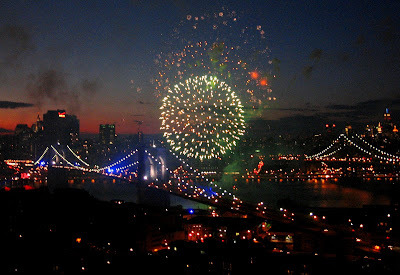 Tonight's events include the Brooklyn Philharmonic with special guest performances (including Marvin Hamlisch), followed by a Grucci Fireworks extravaganza, with festive lighting illuminating the entire Bridge. And don't forget the amazing Telectroscope! Here's the link to this weekend's schedule. Photo of Brooklyn Bridge (bottom) and unsigned poster (top) by MK Metz. 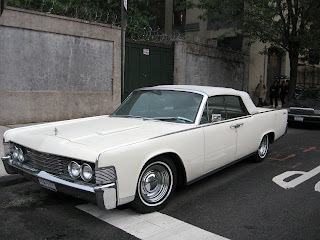 This squeaky-clean '65 Lincoln caught our eye as we were wandering around Fulton Ferry Landing. Sweet! 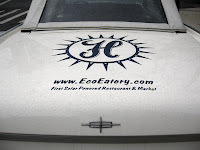 Then we noticed something painted on the back hood: "www.EcoEatery.com, First Solar-Powered Restaurant and Market." Turns out the EcoEatery car belongs to the Habana Outpost in Fort Greene, which prides itself on being an Earth-friendly community gathering space (with Latin-style food). Oh yeah! 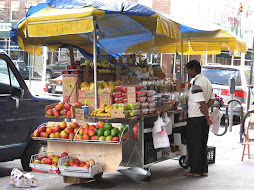 The place with the bicycle-powered smoothie machine. Here's a description on Yelp: "Running off solar energy, having cups and cutlery made from biodegradable cornstarch, being adorned by bright murals and having a smoothie machine powered by either you or some kid on a bicycle (ATTN: child protective services) is only the tip of the compost pile, er, iceberg of HO's twice mentioned pure awesomeness." Anyway, if you're not into the Brooklyn Bridge fireworks, Habana Outpost is celebrating African Liberation Day. The opening reception for "Back to My Roots," a photography exhibition celebrating the people of Ghana, is tonight at 7 p.m. The amazing Telectroscope was assembled yesterday afternoon and into the night at Fulton Ferry Landing, near the Brooklyn Bridge. Many people don't know that a secret tunnel runs deep beneath the Atlantic Ocean, between London and Brooklyn. We certainly didn't. Yesterday, the tunnel was finally completed. 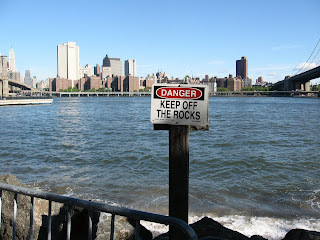 The opening on our side of the planet is on the pier at Fulton ferry Landing, naturally. The extraordinary optical Telectroscope was installed at both ends -- to allow people to see right through the Earth from London to New York and vice versa. According to its creator, the Telectroscope acts as a visual amplifier, allowing people to see through the tunnel stretching from one side of the world to the other. You will be able to wave at people in London as they wave at you. Know someone you'd like to see over there? Arrange to meet at the same time (don't forget the time difference!) and "helloo!" across the miles. Artist Paul St. George has created this device. (All questions about its functioning should be directed directly to him...) It should be open to the public today, if all goes well. Through June 15. Free. More here. UPDATE: The Telectroscope is up and running! See here. 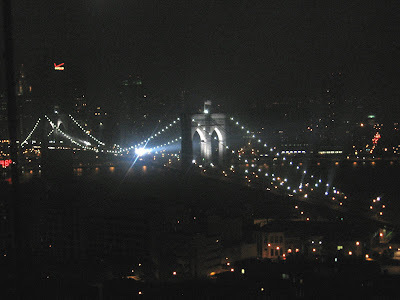 Spotlights were aimed at the towers of the Brooklyn Bridge last night and into this morning as crews prepare for the big 125th birthday of the Brooklyn Bridge. 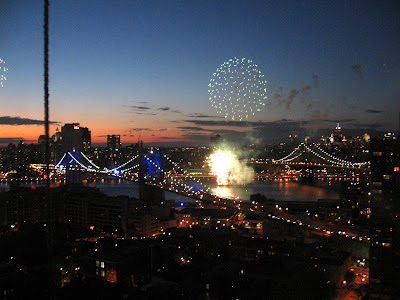 Festivities -- which include fireworks, movies in Empire/Fulton Ferry State Park, lectures, tours and art happenings -- start Thursday. 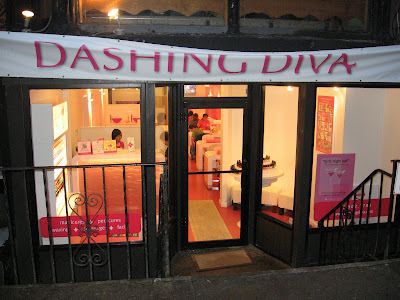 Dashing Diva, the high profile nail salon, has opened for operation at 130 Montague Street in Brooklyn Heights. 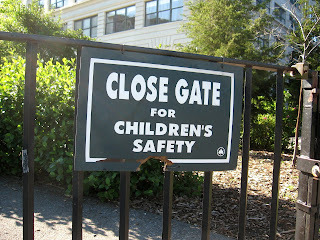 Hope the sign is temporary. Say that, in spite of all the spiffy new signage pointing you to the Brooklyn Bridge walkway, you still can't see where the entrance is . 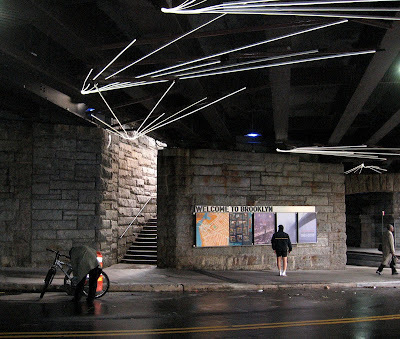 . .
Not to worry -- just follow the glowing, dynamic arrowy things that now festoon the ceiling of the rather dark and dingy Brooklyn Bridge overpass. Hey guys; it's this way! No more confused tourists wandering around Cadman Plaza trying to find the Brooklyn Bridge. It's one of those "Why didn't we do this before?" 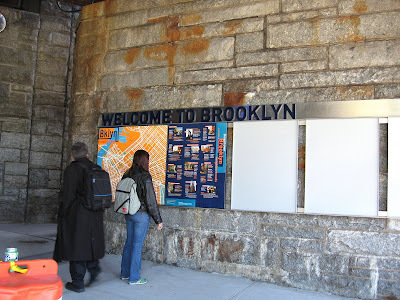 ideas: The Brooklyn Bridge pedestrian entrance and nearby walkways are finally getting directional signs and even a map, courtesy of the DUMBO Business Improvement District. NYC.gov says the improvements are all part of the preparations for the Brooklyn Bridge's birthday bash, but the BID listed these and other improvements (such as reopening the Manhattan Bridge arch as a pedestrian walkway) as part of their 2007 Initiatives. Where to Study Late Night in Brooklyn?